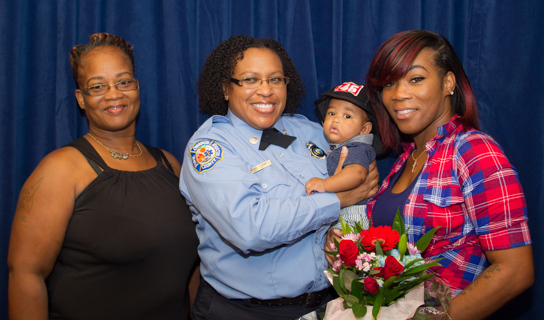 When Orange County Fire Rescue dispatcher Rene Cheek answered an early morning 911 call on November 2015, she had no idea what to expect. In her line of work, dispatchers are always prepared for anything and are extremely cognizant of providing exceptional customer service. This call involved a mother who was in labor and Cheek realized that the birth was imminent. First responders were already en route to the scene, but in this case, the baby was not going to wait. Cheek was able to keep the caller–the expecting mother’s mother–calm and give her clear and concise instructions. Just moments into the call and thanks to Cheek’s assistance over the phone, the baby was safely delivered. Cheek provided instruction for the baby’s airway to be cleared before the baby was wrapped in a warm towel. She remained on the phone and offered reassurance and congratulatory wishes to the new grandmother until Orange County Fire Rescue units arrived. As a result of her actions that day, Cheek was one of 16 Orange County employees invited to meet with Mayor Teresa Jacobs at the Mayor’s Employee Appreciation Coffee. Cheek shared with the group that the key to her job is keeping callers calm while keeping herself cool and collected. Cheek credits her extensive emergency medical dispatch training and unwavering support from her dispatcher teammates for her ability to succeed at her job. During dispatcher training, candidates learn how to walk a caller through childbirth, CPR, first-aid administration, seizures, snake and other animal bites, accidental poisoning and fire emergencies. Kimberly Stewart-Horan, Division Chief of Communications at Orange County Fire Rescue, believes to be a good dispatcher, one needs to be calm, understanding, empathetic and adaptable. Stewart-Horan has seen firsthand the extraordinary efforts, dedication and determination that goes into being a 911 dispatcher. She appreciates and applauds their efforts. Cheek shared that she loves working with first responders and other members of the dispatch team and has always enjoyed helping other people. The fact that she can make a difference at a critical moment in someone’s life means a great deal to her and motivates her to do her job as efficiently and effectively as possible. For more information about Orange County Fire Rescue, as well as emergency and safety information, visit www.ocfrd.com or contact Public Information Officer Kat Kennedy by calling (407) 836-9074. To view more photos, visit Flickr.